Children in Beirut's Shatila refugee camp. Credit: Rebecca Murry/IPS. BEIRUT, Dec 28 2013 (IPS) - As refugees from Syria continue to pour into Lebanon, the majority of children are not going to school, spurring concern that they will become a ‘lost generation’. Awad, 12, and her little sister Eman, 10, are among the vulnerable new arrivals. Having fled Damascus after their father was killed, they settled with their mother in a squalid room in overcrowded Shatila refugee camp. Originally built for Palestinian refugees in 1949, the makeshift camp now shelters a new wave of impoverished Syrian refugees searching for affordable housing, Palestinians fleeing Syria, and migrant workers. “We only eat one meal a day that our mother cooks, in the evening." Their mother remarried, but her Lebanese husband soon abandoned her, leaving her pregnant and penniless. “We now have a problem paying the owner rent – we have no money,” said Awad. The two sisters stay home all day, leaving only three times a week to visit a local NGO for activities like drawing and a rare opportunity to mix with kids their own age. Mostly they rely on their colouring books to keep themselves entertained. They lack schoolbooks, television and a social life to occupy their time. Zuhair Akkawi, a social worker at the Beit Atfal al-Summoud community centre, which runs activities for Palestinian and Syrian children in Shatila, says they are overwhelmed. Out of the more than 1.1 million Syrian child refugees worldwide, 385,000 are registered in Lebanon with the United Nations High Commissioner for Refugees (UNHCR). In an alarming report, ‘The future of Syria: Refugee children in crisis’, the agency says that 80 percent of the 270,000 school age Syrians in Lebanon are not getting an education. Lebanese law states that education is free and compulsory until age 12. Recent legislation has upped the mandatory age for education to 15 years, but it has not been implemented. Syrian psychologist Khalil Yosef counsels Syrian children in Lebanon’s northern city Tripoli. He says that among the obstacles preventing Syrians from staying in school are expenses, the need for children to work instead, and the Lebanese curriculum, half in French or English. Syrians, with their Arabic-only education, can’t keep up and often drop behind, or drop out. Now the area’s overcrowded Lebanese schools have produced a separate afternoon shift for Syrians after Lebanese students finish at lunch, where they learn from a translated Arabic curriculum. Yosef says the children are often traumatised by violence in Syria, and have difficulty adjusting to the challenges of insecure lives in Lebanon. “They are aggressive towards other students and the teachers themselves,” he said. “They don’t listen, skip classes, and when it comes to attending school in the afternoon, it’s hard because the whole day’s routine has to change. They return home from school at night. 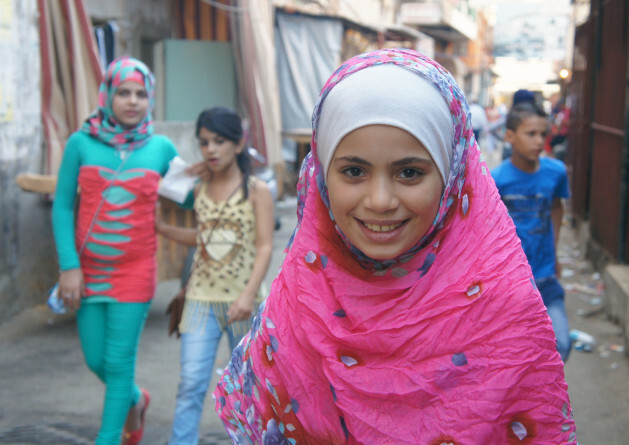 Fatima, 11, is a Palestinian who fled from Homs with her family. Her father, a house painter, cannot find work in Beirut and all their relatives stayed behind in Syria. “I felt very lonely when I got here because I had no friends. It took time,” she said. She now attends a school for Palestinians run by the United Nations Relief and Works Agency (UNRWA), and stumbles over the English-Arabic curriculum. She relies heavily on her mother and neighbours to tutor her after school.